Looking for the secret rooms in Las Vegas where deals are brokered and information is traded? There’s one thing they have in common: a river of marinara flows through them. The longevity of Piero’s is matched only by that of its fiercely loyal clientele. As journalists and football fans around the country wondered whom the San Diego Chargers would hire as their new head coach, the owners of the restaurant Piero’s in Las Vegas had the scoop. Why would the proprietors of an Italian eatery sitting inconspicuously just east of the Strip be so well informed about the future of an NFL franchise? “Alex Spanos, the owner of the Chargers, is in here every time he’s in town,” says Glusman, whose restaurant, famously featured in the 1995 film Casino, opened in 1982. “We kept seeing him in here meeting with one guy in particular. One Mr. McCoy, as it turned out. 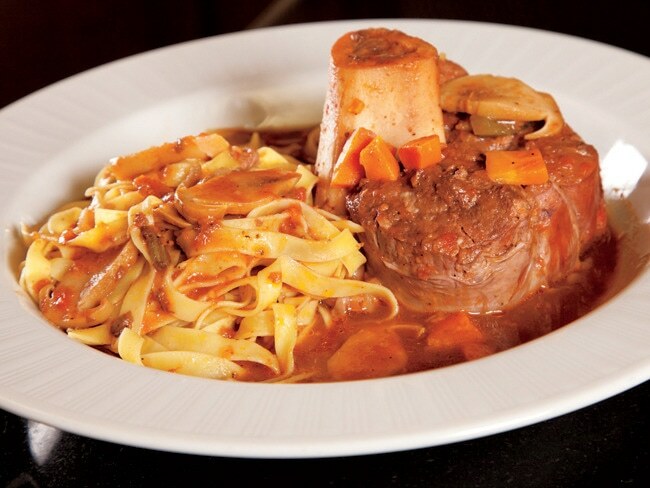 The famous osso buco at Piero’s. Deals are made, relationships are cemented, and news unfolds (eventually) at throwback Italian restaurants throughout Las Vegas. Such long-standing late-night haunts as Bootlegger Bistro, Battista’s Hole in the Wall (known for its strolling accordionist of more than 30 years, Gordy Jaffe), Casa di Amore, and Capo’s Italian Steakhouse are havens for chummy gatherings of the famous, powerful, and influential. Also random was the recent night when Magic Johnson sat at one table and Michael Douglas at another. Or Jerry Lewis in a corner booth and across the room Rich Little, watching a cabaret show hosted by Pia Zadora. 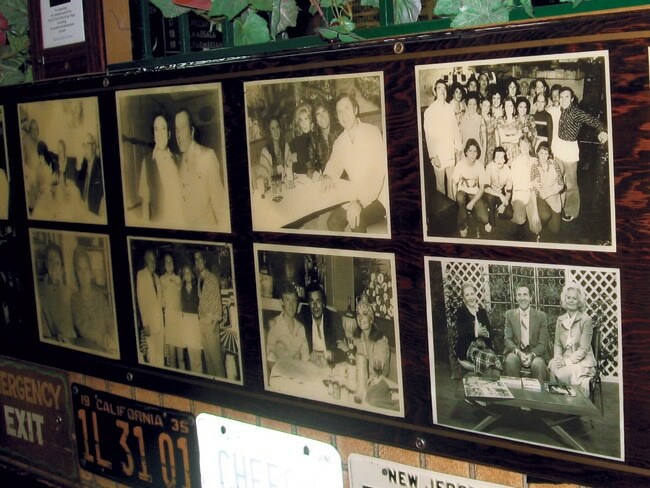 The walls of Battista’s Hole in the Wall hold 43 years’ worth of memories. There is a comfortable, even womblike feel to these haunts that makes their customers—famous or infamous—feel at home. 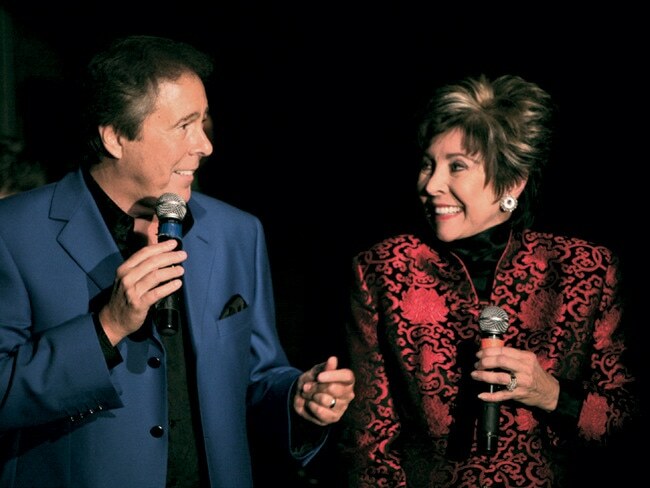 At Capo’s one night several years ago, a small cluster of Vegas lounge entertainers arrived for a postshow dinner. In the room was a woman dressed regally in a black sequined dress. She was Antoinette Giancana, who at the time was meeting covertly with casino officials about a planned mob attraction to be staged at the Tropicana. One of the entertainers, exposing his naïveté, asked the daughter of notorious Chicago mob overlord Sam Giancana if her life had ever been threatened. “You should know not to ask me that,” Giancana coolly replied. Bootlegger owner, and star performer, Lorraine Hunt-Bono with husband Dennis Bono. The restaurant favored by former Las Vegas mayor Oscar Goodman each New Year’s Eve is an Italian joint, too. It’s Salvatore’s at the Suncoast, in the northwest Las Vegas suburb of Summerlin, far away from the Strip. 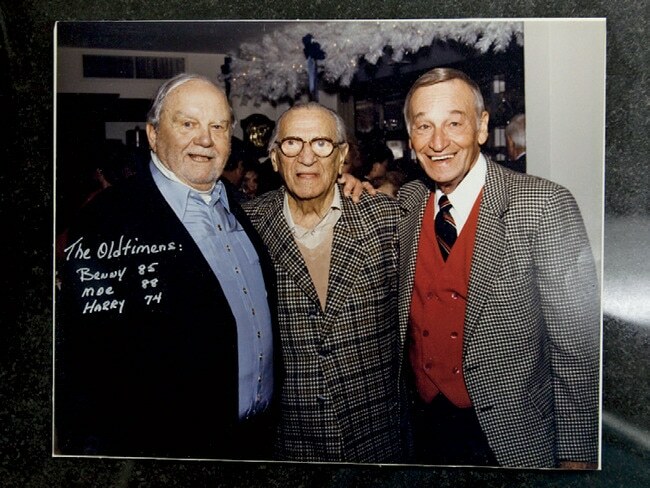 Goodman has long been a friend of Salvatore’s operator Bob Harry and his former partner Jim Girard, from their days as owners of the Tap House sports bar and the restaurant Fellini’s on West Charleston Boulevard (Fellini’s is now located at the Stratosphere hotel-casino). Girard is currently helping to revive the Italian American Club on East Sahara Avenue, with bocce tournaments outside, classic crooners inside, and the aroma of red sauce wafting from the kitchen.